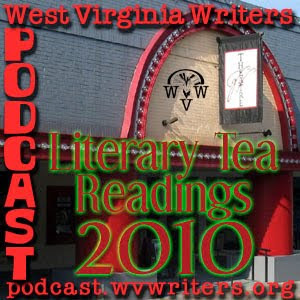 This recorded live reading comes from the September 16th Literary Tea session at the Greenbrier Valley Theatre in Lewisburg. WV Writers' featured reader is Miles Dean, honorable mention in the Humor Category of the 2010 WVW Annual Writing Contest as well as voted the 1st place winner in poetry for the Writers Wall at the 2010 Summer Conference. The Literary Tea series continues October 7 and October 14. They take place at 5:30 p.m. at the Greenbrier Valley Theatre in downtown Lewisburg. If you're a member or extended friend of WV Writers, Inc. we invite you to submit your own recorded live readings to wvwpodcast@gmail.com. 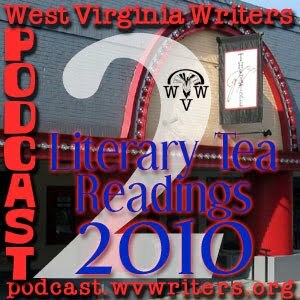 This recorded live reading comes from the September 9th session of the Greenbrier Valley Theatre's Literary Tea series. The WV Writers featured reader is Bob Clark reading a portion of his wife Brenda Clark's 2nd place win in the Children's Book category of the 2010 WVW Annual Writing Competition. The featured reader from the GVT staff is Kurtis Donnelly reading a short story by playwright Arthur Miller. The Literary Tea series continues September 16, October 7 and October 14. They take place at 5:30 p.m. at the Greenbrier Valley Theatre in downtown Lewisburg. Back in July, we worked with a producer of National Public Radio's show State of the Re:Union to drum up support for their "Dear City" letters segment to help them find material for their upcoming show based in West Virginia. We thought it would be fun to do something similar for our podcast and, with their consent, are going to do so. The Dear City Letters are basically what they sound like: people writing a letter TO their city. These can be written from a place of love, anger, humor and beyond, addressing the likes and dislikes or breaking misconceptions. As part of our collaboration, the WV Writers Podcast opened its voicemail hotline to listeners to phone in such letters. We forwarded those we received to State of the Re:Union and are planning to also use them for an upcoming podcast. If you would like to participate with your own Dear City letter, please do so, for there is still time. People can feel free to be as creative as they'd like... the only constraint is to keep it under 400 words. Also, remember to refer to your home in the second person (You). We want these to sound like you're speaking directly to your home. Once your letter is written, phone up the WV Writers Podcast voicemail hotline so we can record it. The number is 304-661-9745. When you call, you will have 2:45 sec to record your dear city letter. If your letter runs longer, feel free to call back and record the rest. If you mess up, just say 3…2… 1 and start where you left off; we can edit out the errors.